What’s Wrong With These Graphs? I generally haven’t used this blog to comment other groups and their points of view but I have seen a number of graphs that just rubbed me the wrong way. Why did it bother me, well I work with data for a living, and when I see data poorly presented (whether deliberately or not) in an effort to make a point it upsets me. You can see the Citizens for an Accountable Mega Hospital Planning Process (CAMPP) graphs on the data section of their webpage and they have popped up on Social Media over the last week or two. 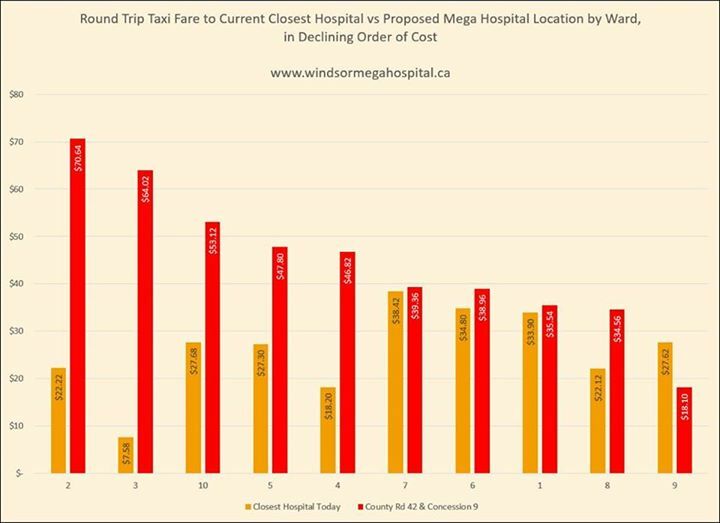 So far they have calculated Taxi Costs to the new Mega hospital site, the Total Aggregate Distance traveled; and the Distance to the Hospital from City Hall comparing Windsor to many other communities. To offer my full disclosure, I have written my feeling initial feelings on the Mega-hospital plan on this blog and I think at some point I signed the CAMPP petition. Since than my opinion has evolved a little with me more or less settling on I would like it in the City but am not opposed to the proposed location. Now I don’t believe that this group is trying rouse rabble as some in the Windsor Star and social media have claimed but I do feel that some of the information they have presented is a distortion and not only hurts their cases but also clouds the wider discussion around the hospital site and its impacts on our region. Now, I had never heard of World Taximeter before I saw their post and I don’t have any idea how accurate it is or isn’t (a bit on that in a few paragraphs). What is missing from the calculation is an inquiry of how much it would cost to take a cab from the County (note they did add this to their calculations after I wrote this section of the post, my numbers and theirs are pretty close). What CAMPP does like to discussion as it is beyond their mandate is the fact that Windsor-Essex County has a regional health care system and people who have accidents, injuries or illnesses in the County are transported into Windsor to one of the two in the city (Met being the primary urgent care facility for the County). Yes Leamington has a hospital but almost all serious and surgical cases come into Windsor. Unfortunately no calculations were offered for the cost increases or savings for someone living in Amherstburg, Essex, Tecumseh, Belle River, Kingsville or Leamington to the new Hospital site. Other cost calculations. Bracketed values are negative and represent a savings. As you can for for individuals in several communities World Taximeter has come up with modest savings ($20 round trip) at the new site. The fact that someone from Amherstburg is paying over $120 according to the calculator to get to the City and back is a separate issue (Regional Transport anyone). Which brings me too a couple of issues the tool itself. After some googling of reviews I found that most calculations have a 10% discrepancies in the fares listed to actual amounts paid and the time of day has a major impact on the fares accuracy. Part of the issue is that the calculation tries to estimate waiting times based on historical traffic usage. This means that if you input a cab cost at 3pm you will get a different amount returned to you at 8pm (the same is probably true if you were actually taking a cab). Without knowing what time that the calculations were made, there is no way to accurately compare the costs (Note: my estimates were calculated between 9 and 10 pm). As a result, the fares that are currently being measured are the cost to get to a field on the border of the City. The calculator can’t accurately measure what it will cost to get to the eventual hospital in 7 to 10 years because traffic patterns haven’t changed. Once there are actual facilities out on County Road 42, there will economies of usage that will dictate that cabs will be used to traveling there, using the most efficient route and infrastructure will be expanded to accommodate that traffic, thus driving down costs. The second issue is that the calculator or CAMPP don’t account for flat rates or any negotiated fees as a part of the trip to the hospital. A google search for Leamington to Windsor Cab fares found $65 dollar cab fares to Windsor. Again, not cheap but a consistent cost that would not change regardless of where the hospital is. Many county communities have a similar flat rate costing to get to Windsor. A call to Veteran Cabs told me they don’t do flat rates in the City but in speaking to two separate drivers over the weekend, who generously gave me their personal cards, they did tell me that for a consistent service a flat rate could be directly negotiated with them to get me to the hospital. This chart shows the total distance that would be traveled from each city ward (and selected County Communities) if EVERY person from the ward went to the new hospital location subtracting the distance they would have had to travel currently. Setting aside that a rigorous calculation would have controlled for population using a weighted average. Last year only 28,000 people were admitted to Windsor Regional Hospital for the number of admissions to reach the level that was calculated (approximately 300,000) it would take a decade or more. If Leamington was included It could be suggested that families accompany admissions but there is no way to tell if families are traveling from the same location or are they coming from out of town to see their family member in the hospital as a result any direct calculation would not be supported in fact. Beyond this, I am still not sure why LaSalle, Amherstburg, Leamington or Kingsville aren’t calculated. Although CAMPP have said that they exclude Leamington and Kingsville due to the local hospital in South Essex. Unfortunately, Mega-hopsitals have a history of resulting in the closure or loss of services in small hospitals. The Niagara region, Oxford County, Wallaceburg to name a few. Leamington and Kingsville residents already travel to Windsor for many surgical procedures so by not including the entire county in any calculation leaving important data out of the discussion. City Halls are a potential measure for the centre of a city but not the measure for where people live in the City. In the case of Windsor, City Hall is at the extreme north end of the City meaning that almost everyone in the city (except for a small portion of people living on Riverside Drive) actually live closer to the new hospital site than the City Hall! From a planning standpoint many of the communities listed are not on bodies of water/or a border which in turn allowed for a circular development pattern around a city centre. As a result they likely haven’t had the singular directional of sprawl that Windsor has faced which in turn has enabled a more even development pattern and compact urban centre thus lowering the distance to the Hospital. If CAMPP really want to measure how close people are to the hospital, they should look at population density and see where people actually are and how far they are from the hospital. Population age could be another measure, as age correlates clearly with health care needs. As a result, older segments of the city are more likely to need a greater proportion of health services than younger segments of the city. These might be difficult to track down but they are measures with greater rigor than drawing a line from an arbitrary building in a city centre. The other issue is that their measurements (this hold true for all of their calculations) calculates to the nearest Hospital while at the same time they fail to account for the alternative sites that will be developed as a part of the Mega Hospital plan. The Grace Site, Tayfour site, and Ouellette site will still be medical facilities in the City of Windsor, will still be staff by hospital staff and still play a roll in their neighbourhoods and communities. True not every service is offered at each site but today with the two hospital sites certain facilities are prioritized for certain procedures (Met having the Cancer Centre for example). Some long term care and surgical recovery and rehab already occurs at the Tayfour site, meaning that daily visits to the Mega-hospital may not be required to see a recovering family member. As a result, they have in my opinion a set of shifting goal post and by not measuring all possible alternatives clouds the arguments that you are trying to make. 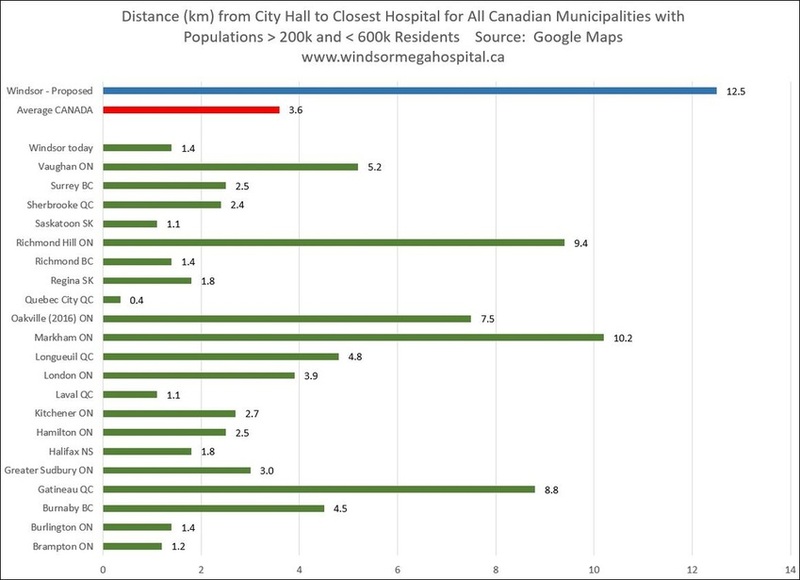 Why are you measuring to the closest hospital from City Hall when most citizens of Windsor live outside of Ward 3 doesn’t make sense. Beyond Windsor in many of the City’s that were offered in comparison, they are apart of larger metropolitan areas where residents have access to different facilities out side of their city boundaries if they wish to use them or they have multiple hospitals in their community which means measuring from City Hall is only telling part of the story. Given the above, all of these estimates are to reach a facility that will not be built or in operations for 7-10 years, resulting in assumptions about current costs being applied to the future. Their arguments assumes that the same City Councillors who are being lobbied by this group to not support the hospital site are not going use the Mega-Hospital location as a primary reason to invest in transit across the City and Region, install bike lanes and ensure residents have access to medical treatment. Maybe those routes won’t be as quick as a cab/car but they will be cheaper thus giving individuals an option. They also assume that over the next 7 to 10 years that Uber or some other transit disruption doesn’t occur, driving down taxi costs or that the taxi companies won’t implement a flat fee to get you to and from the hospital. They don’t take into account the possibility that there may be a transit shuttle connecting the 4 hospital sites (Tayfour, Grace, Ouellette and County Rd 42) for staff and patents, something which I have heard is rumoured will be implemented. Will it be free, probably not, will it be less than $100 probably. Here’s another important point: we haven’t yet seen the impact of the proposed hospital site on the cost of ambulance services. This graph is as good of a proxy for the direction of EMS costs as we could expect to see at this point in the process. Windsor-Essex Residence for an Urban Mega-Hospital. Lets be clear, EMS costs are completely separate from individuals transit costs so to even equate them in the same discussion is clouding the issue. There are currently 12 EMS stations around the City of Windsor and in the County. Since EMS operates in the County and regularly brings patients into the city, easy access to a hospital on the South end of the city will probably improve patient outcomes as minutes = lives saved and dollars don’t matter. To claim that taxi costs which are designed to make profit for the cab company and driver equates to a publicly funded EMS system is a poor association at best. I think that what the CAMPP and other Mega-Hospital groups are doing a public service by sharing information about the possible impacts of the Mega-Hospital site. But when they share data, that is in my opinion, clearly biased or incomplete they are doing themselves and this debate a disservice. If they truly want to change minds (particularly of the committee) they need hard facts backed up by rigorous methods. How many West-End or Downtown residents will be forced to take a longer taxi ride and pay out of pocket? For some of them, the high cost of the taxi and penny pinching that could result may be a price worth paying for getting relief from pain or the treatment of an illness. So how many low income people in Windsor does that leave without access to medical care from the Mega-hospital? No location is perfect, no site will be without disadvantages, if the CAMPP want to change the Ministry of Health’s mind they will need to prove that the proposed location isn’t only bad for the city but bad for people’s health and in an ideal world offer alternative locations or solutions to fix the problem. I am sure that those involved in the CAMPP project will disagree with parts (or all) of my and they are free to do so. I am happy to comment on this but based on the data they have posted they haven’t changed my mind and I doubt that they have changed the Ministry’s. I am very happy you chose to write about the charts we have been circulating, though there are a number points in your blog post that I’d like to pick up on. Transparency and public input were always supposed to be cornerstones of the process. In CAMPP’s view, there needs to be far more public discussion about the ramifications of moving our acute healthcare out of the core. 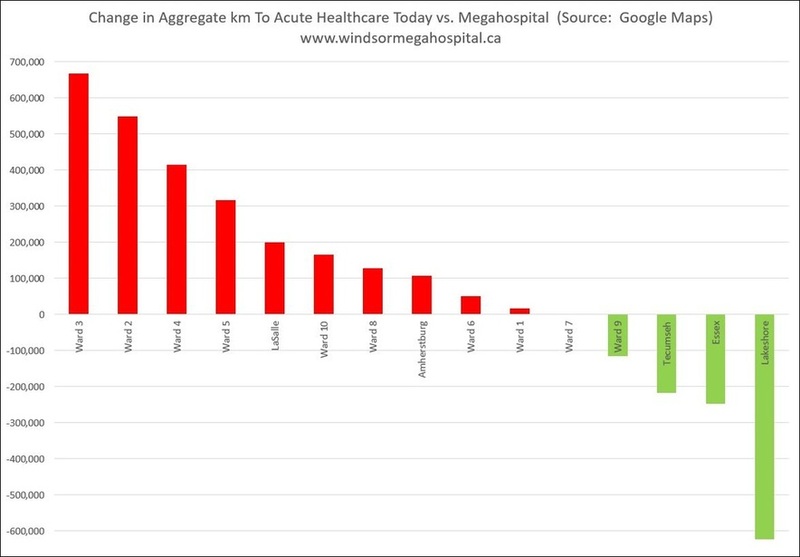 •	Would a new single site acute care hospital improve the delivery of acute care services in Windsor-Essex County? •	Would a new single site facility provide value for money? •	If there is community support for a new hospital, what other considerations must be addressed during subsequent planning phases? We all agree that this is a regional project – even though I should also point out that the report doesn’t mention anywhere that the current hospitals come up short in terms of access to any one demographic group. CAMPP have frequently been accused – falsely in our opinion – of being city-centric. Clearly the best location for our new acute healthcare facility is one that balances aggregate city and county needs, access being the most important. We also maintain that a healthy core is essential to the well-being of our entire region. You raised some questions about the source of the fare data. In fact, the starting point was the fares chart that taxi drivers provide their patients. The base rate is $3.50 and they charge an additional 10c per 64 meters. There is a further charge for time sitting in traffic, and that clearly depends on route and the time of day. The site used to calculate the fares in that chart was intended to be an objective, fact based source that anybody can use to check the rates for themselves, as some skeptics in fact did when we first posted the chart. Their real life fares were very close to what we posted. The intention of the chart was to highlight the high cost to low income urban dwellers of travelling to the hospital location to the south of the airport, and how much higher this is than what they experience currently. It was never intended to imply that everyone is going to access the hospital by taxi. While we don’t have data on car ownership or what % of hospital visitors show up by taxi, it is well documented that few live without a car in the county, while Windsor has many urban residents who don’t drive. Bus transportation might be an option, but not always. For many older and lower income residents, especially if they have mobility challenges, taking a cab is the most efficient option for getting to hospital. Even if passengers negotiate a flat rate, it’s still going to be more expensive than currently if the distance is further. In the absence of evidence that many people come to WRH from the county via cab, I maintain that this particular analysis is only relevant to Windsor residents. You mentioned that only 28,000 people were admitted to WRH last year. There are far more reasons to visit the hospital than inpatient admissions alone. The WRH site lists: 1.5 joint replacements, 61k cancer care, 13k chemotherapy and 21k radiation visits. Of the 129k ED visits, I don’t know how many of those will end up being treated at the UCC – perhaps the 40% as suggested by the location announcement? Does that mean some 78k people will go to the Mega Hospital? WRH doesn’t list how many patients are treated in ambulatory care clinics or with day surgery, but I’m pretty sure these run in the tens of thousands. I don’t have enough information available to know if the 5k cataract surgeries and 25k fracture clinic visits will take place. Then there are the consultations, including pre- and post-op visits, with surgical specialists who will be either at the Mega Hospital or in their offices, almost all of which will be close to the hospital to allow them to deal with emergencies quickly. Many of those procedures are performed in Leamington today. So while it is true that the most serious hospital admissions will include Leamington and Kingsville residents, the bulk of WRH patients come from municipalities not directly served by LDMH. You wrote “a rigorous calculation would have controlled for population using a weighted average”: that is exactly what the aggregate calculation was aiming to achieve. The calculation is a weighted average (distance multiplied by the relative population of each area). If anything, the chart underestimates the scale of the incremental distances, because neighbourhoods that are home to more lower income and older residents are more likely to see higher medical need than the relatively wealthier and often younger county towns. If we had access to patient data, you can be sure we would have used this instead. We had good reasons for starting our distance analysis from each city’s city hall. How else could you come up with an objective starting point that is common to each municipality in Canada? An earlier version of the analysis tried to pinpoint population densities, but this is difficult to achieve without appearing to be biased. That our location is the furthest in the entire country, should be a red flag that we have a habit in Windsor of paying far too little attention to our development decisions. As long as the vitality of our urban core is important to us, we need to pay attention. Of CAMPP’s 4 broad groups of concerns, urban planning (or lack thereof) has always been a major focus of our discussion. Planning policy at both the municipal and provincial levels both support intensification of the core. To ignore the role of a city hall as the heart of a community would be to imply that we no longer place importance on our established urban structure. Are we going to let go of the core of the city because an unelected committee of people dominated by the Board of WRH, without any urban planning expertise, have decided to move 4,000 jobs to the outskirts? In our opinion, the core will always be a healthy community’s tether, and an objective measure of distance is absolutely relevant. As to Windsor’s core being to the north, it’s a fair comment, but there are plenty of other cities with unusual shapes – a fair number of the ones listed in the chart similarly developed along a waterway. The main point we’re making is that this location is an anomaly. Just because the steering committee chairs describe it as perfect, does not make it so. That CAMPP is focusing mainly on the acute care hospital is with good reason. It’s the only facility that will provide acute healthcare services and it’s where the majority of patients will still be going. As I mentioned above, it will be home to the area’s only ER, ambulatory care clinics, ORs, Cancer Care, and it is where patients will see surgical specialists. If shuttle buses are laid on to facilitate transfer between locations, let’s hear how much the service is expected to cost the community before making the final decision. But let’s also question whether it makes sense to pay for runarounds when a more efficient approach starts with a more centrally-located hospital. We don’t have any specific objections to the other parts of the plan, other than increasing the number of facilities seems somewhat counter-intuitive for a project designed to streamline services. You make a good point that there could be some efficiencies for county residents as a result of the EMS stations that are closer to the city. However I have no reason to believe that the total ambulance km travelled will fall as a result of a location that is further away from the greatest concentration of residents. But in that case, wouldn’t it be more cost-effective to invest in a couple of county EMS stations instead? I am curious whether an impact analysis has even been performed. I have no argument with your suggestion that there is a need for “hard facts backed up by rigorous methods”, though I would suggest that the full onus should not be placed on a citizen group working with limited access to hard data. You mention metrics which may have been valuable to our position – believe me, we would like them too! This task would also be a lot easier if doctors and nurses felt empowered to speak in public. They are the people who know where their patients are coming from and their observations and experience are vital to the conversation. We know our charts have piqued the interest of many residents – and who have corroborated our concerns with their own real life stories – some of whom didn’t realize quite how far away the proposed site is from where they live. We intended them as a starting point for a public discussion that has not been encouraged by City Council, WRH or even our LHIN. One of my biggest disappointments so far has been the lack of hard facts coming from WRH. Even now, they continue to repeat the mantra that the new hospital will need to serve both the county and the city, without feeling the need to substantiate their position with substantial facts of their own. The City of Windsor surely has detailed demographic data that would support our concerns. For that matter, the United Way likely also has information that should be setting the alarm bells ringing if the Province does give the go-ahead. If you do have such data available, I would be very interested in sitting down with you and disseminating it together, or reading your analysis if you prefer to write it up alone. Finally, my apologies for such a lengthy response, but you provided plenty of points for discussion. How come a decision such as where to place a major health care institution falls to a panel of volunteers yet the city pays a million bucks to a traffic guru to tell us where to place a highway. Isn’t health care just as or even more so important than a parkway. An unbiased Dave Cooke? The whole new Windsor Essex MegaHospital site selection criteria was rural biased from the start, long before developers submitted sites. This type of rural greenfield site was preordained by bad WRH data. 3. How much to Grace site… Was told approximately $15. I did in fact talk to some cabbies this past weekend as I outline in my original post. No matter where they put the hospital someone will pay more to get there if they are traveling by cab. It is an unfortunate fact. It’s inevitable that any new location will be further away from somebody. The trick is to optimize access. While I realize it’s not easy, I am convinced that the proposed location falls far short of the mark. We simply can’t afford to move our acute healthcare away from the residents with the greatest need – that is, our elderly and our lowest income residents. While people on low and fixed incomes live in most of our neighbourhoods, there are certain areas with known greater concentrations of need and we cannot leave those residents high and dry. An urgent care centre 5km away or a promise of a bus service won’t cut it. Hi Everyone, I do plan on commenting to your comments I just didn’t have time last night or this morning.